If you have made the big decision of setting up a company in UAE but wondering how to start your own business? how to register a company? What are the various options available? You are at the right place. Shuraa Business Setup is a one-stop destination for all your business needs, guiding you through the various steps of starting a new business. Speak to a business setup expert or company formation consultant to understand in detail. Book a free business setup consultation today! Business Setup can certainly be a determining as well as a demanding thought. Dealing with the government official in a foreign country, getting your business plan straight, finding investors, establishing a budget, regulating the costs, identifying the prospective market, reaching the customers – the list goes on. 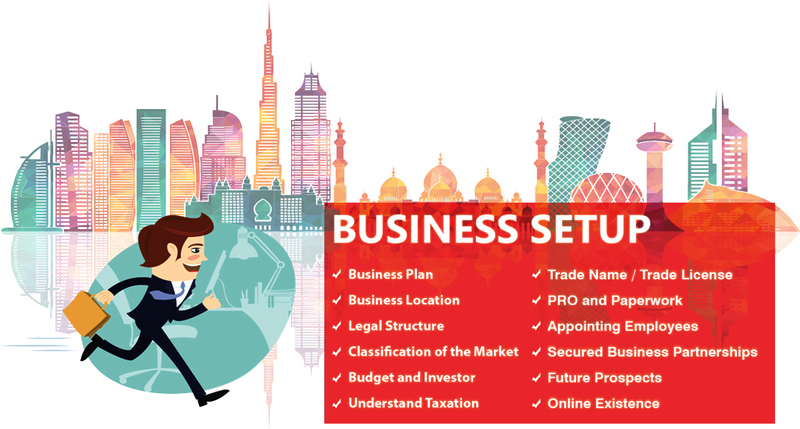 Nevertheless, Shuraa business setup service providers ensure that you covered with all the aspects of starting a business in Dubai or anywhere around UAE. While starting a business in UAE having a business plan at hand is a must. This benefits in defining the legal structure, presenting it to the investors, executing business strategies and so on. UAE business locations highly influence the legal structure of the enterprises as industries are categorised on the terms of jurisdiction. Identifying the legal structure of the business is an extremely crucial decision. The legal structure acts as a supplementary factor on the munificence as well as monetary returns, that can be drawn from the business. The business jurisdiction defines the legal structure of the company – in UAE the jurisdictions are mainly divided into Mainland ,Freezone and Offshore business setups in UAE. Classifying the market and targeting the customers, aids the potential stratification of the business hence planning it beforehand can save time and cost. Also in UAE, acquiring an office space on rent is a compulsion, thus knowing the market at the initial stage provides a definite perspective. Ascertaining the budget of the business setup delivers the feasibility level of the commercial enterprise that you have been planning to exercise; likewise, finding a suitable investor also becomes convenient. Although, Business Setup in UAE does not impose tax or excise duty – understanding the process of taxation is essential for dealing within and outside the country. Company registration is mandatory for Business Setup. Getting your Trade Name registered and acquiring a proper Trade License from the concerned departments is requisite. The United Arab Emirates primarily emphasizes three types of licenses – Commercial License, Industrial License and Professional License. Business Setup involves immense paperwork and permissions from several concerned authorities. This creates a demand for PRO assistance in the UAE. Departments such as the Chamber of Commerce, Municipality, Department of Economic Development, Immigration Department, Embassies and several other divisions are involved. Moreover, getting Arabic translated documents and judiciary approvals is obligatory while setting up a business in UAE. Growth and expansion in business promote division in responsibilities – creating employment possibilities in the company. However, recruiting in UAE can be demanding with sponsorship deeds, labour contracts, visa requirements, and immigration approvals for the employee. In UAE, engaging into a business partnership is frequent – be it a compulsion of having a corporation with a UAE national or involving into a free zone business activity with the need of a local agent, initiating complete protection with your investment is essential. Setting up a Business during the Dubai World Expo 2020 will provide investors and entrepreneurs with a global forefront of opportunities and engagements. Likewise, having a goal, aiming for the forthcoming and creating futuristic prospects is important in a business. Developing connections and digitalizing your business does not only offer your company an online persona but also forms convenience in generating leads. Whether you are a business tycoon, entrepreneur, investor or a veteran in the world of business – taking advice and being guided continually increases the horizons of your business activity. To know how to setup a business in Dubai or anywhere in UAE, speak to our experts from Shuraa Business Setup.